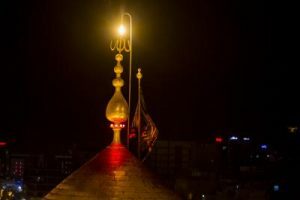 SHAFAQNA- Alkafeel: After the prayers of Maghreb and Isha of Saturday the 30th of Dhu al-Hijjah 1439 AH corresponding to September 10, 2018, for the fourteenth year in a row, the rituals of the replacement of the two domes’ flags of the holy shrines of Aba Abdillah al-Hussayn and his brother Aba al-Fadl al-Abbas (peace be upon both of them) from the red to black, were held to announce the start of the holy month of Muharram 1440 AH. 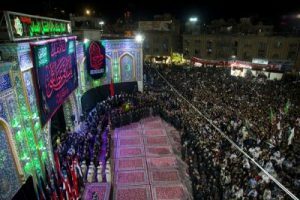 The ceremony was attended by a large number of religious and cultural figures, as well as a large number of followers of Ahl al-Bayt (peace be upon them) who filled the two holy shrines and the square between them. 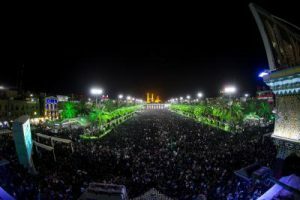 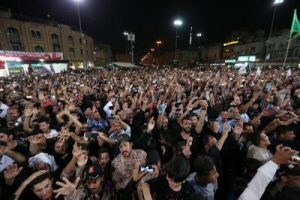 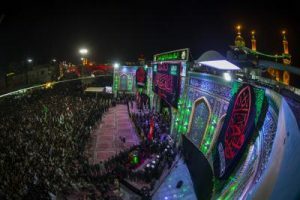 The rituals started in the holy shrine of Imam al-Hussayn (peace be upon him) with a recitation of verses from the Holy Quran of the reader Haj Usama Al-Karbalai, followed by a word of His Eminence the senior official of the Imam al-Hussayn’s (p) Holy Shrine, which was delivered on his behalf by the Deputy Secretary-General for Cultural Affairs Sayed. 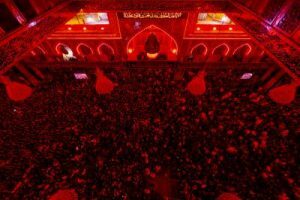 Afdhal al-Shami, in which he stressed on the steadfastness and sacrifice for the sake of the march of Imam al-Hussayn (peace be upon him). 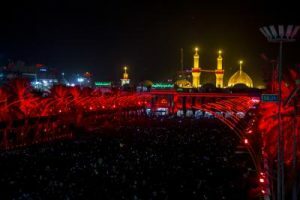 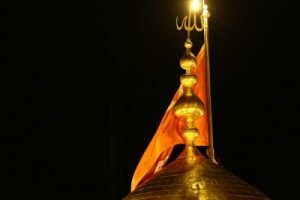 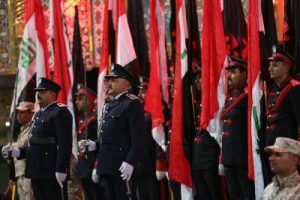 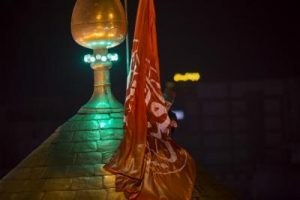 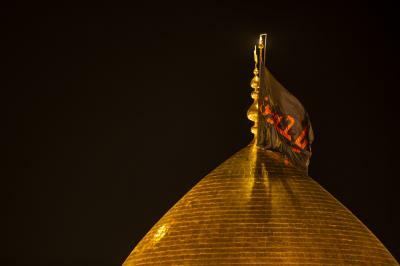 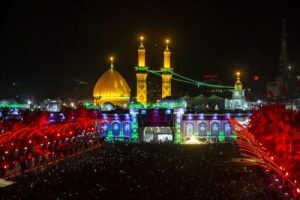 Then, in a condolences sad tune, the red flag was lowered to be replaced by the black flag, while the followers of Ahl al-Bayt (peace be upon them) were chanting “Labbayka Ya Hussayn”, followed by the historical poem of the late Sheikh Hadi al-Karbala’i in receiving this month “Ya Shahr ‘Ashoor [O month of Ashura]” by the late radood Hamza Zghayyar. 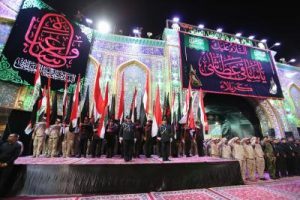 Then the groups headed to the shrine of Aba al-Fadl al-Abbas (peace be upon him) to perform the rituals of replacing flags, similar to the rituals in the imam al-Hussayn’s (p) holy shrine. 1- Our hearts, in this hour, are filled with feelings of sadness and enthusiasm as we receive the month of grief; the holy month of Muharram, the month of mourning for the Imams of Ahl al-Bayt (peace be upon them). 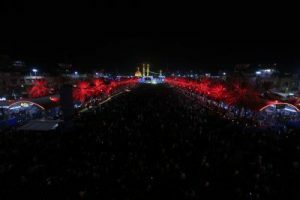 2- We are enlightened by the light of Imam al-Hussayn (peace be upon him) in the darkness of the world and at all the times. 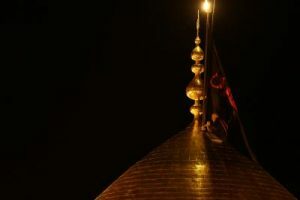 3- In this holy month, the oppressors tried to extinguish the light of the family of Mohammad (Allah’s prayers be upon him and upon his holy Household), who have killed the beloved grandson of the Messenger of Allah (Allah’s prayers be upon him and upon his holy Household), along with his family and companions (Allah’s prayers be upon them all) looting his tents and captivating his children and women and harming them in the most severe manner. 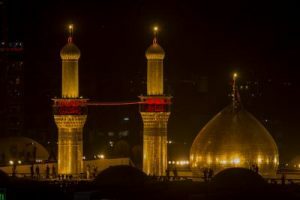 4- The oppressors tried with this crime to extinguish the light of Imam al-Hussayn (peace be upon him), but his pure blood shed on this holy land has revived people after him. 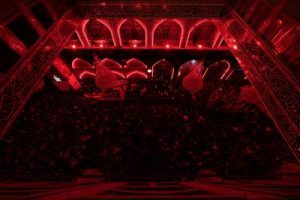 5- The martyrdom of Imam al-Hussayn (peace be upon him) has a heat in the hearts of the believers that will never cool down, but will remain their beacon. 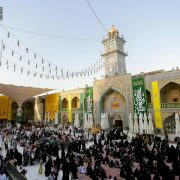 6- The holy month of Muharram has great specificity as all his days and nights are revived in various ways of condolences and rites, complying with the order to the Imams (peace be upon them) to revive their matter and recall that Imam al-Hussayn (peace be upon him) came out for reforming the nation of his grandfather. 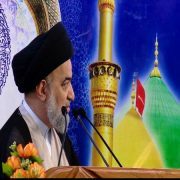 8- While we are reviving this condolences season, we must give all the care to be closer to the Almighty Allah and move away from all that weaken these great rites, which the Almighty has command us to venerate. 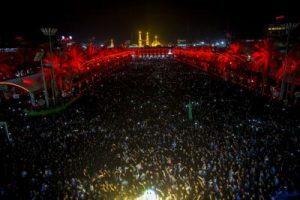 9- The Hussayni rituals was one of the most important factors that made people rush to answer the fatwa of the sufficient duty for Jihad of the supreme religious authority to head to the battlefields and defend the homeland, as they were drawing their enthusiasm and courage from Imam al-Hussayn (peace be upon him), his family and companions (peace be upon them). 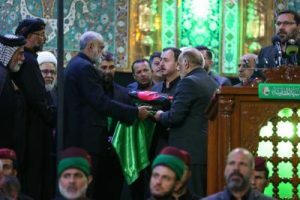 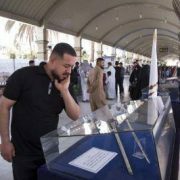 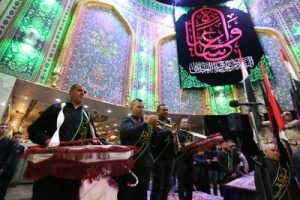 It is to note that the tradition of handing over the flag from one of the provinces of Iraq to be raised on the shrine of Aba al-Fadl al-Abbas (peace be upon him), was held and the Secretary General of the al-Abbas’s (p) holy shrine has received the flag this year from the province of Diwaniyah. 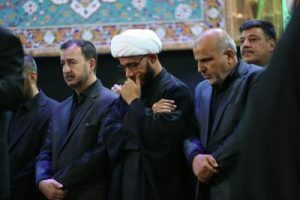 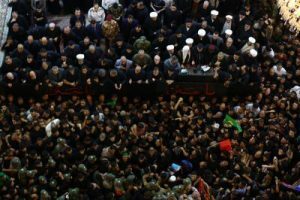 Then, on a sad funeral tune, the red flag was replaced by the black flag.The conclusion was with a condolence Majlis led by the Radood Hussayn Zghayyar. 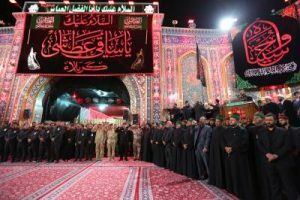 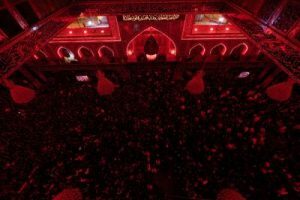 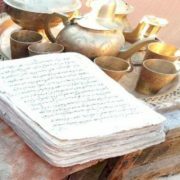 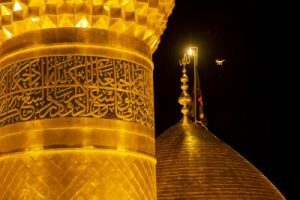 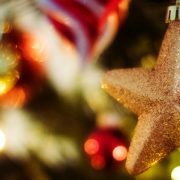 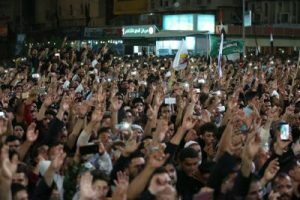 The Supreme Religious Authority: How can we keep our pledge to Imam al-Hussayn (peace be upon him)?